Will Clara Pay A High Cost For Trying To Be The Doctor On Doctor Who? All of the best parts of "Dark Water" have to do with the relationship between Clara and Danny, which takes a tragic direction. And how this affects Clara's relationship with the Doctor — which, in turn, has a shocking effect on Danny. Steven Moffat has spent all of season eight building up the Clara/Danny romance carefully, laying the thematic and emotional groundwork so these events would have the maximum impact. And it pays off beautifully here. In a nutshell, Clara has finally decided to come clean with Danny about all the stuff she's been keeping from him — which is a lot, judging from the massive quantity of post-it notes she's put up. But just as she's about to try radical honesty, Danny gets run over by a truck and is killed. This moment is perhaps the most effective use ever of Moffat's penchant for sight and sound as horror... the weird noises coming out of Clara's phone sound alien and spooky, until we realize what's happened. Clara represses all her grief, rebuffing her grandmother's attempts to coax her to have a good cry — because as she says, Danny's death is just boring and normal. As if after all the bizarre stuff she's seen, she can't take it in. But then, she tries to blackmail the Doctor into using the TARDIS to undo the past, threatening to toss all the TARDIS keys into an active volcano, leaving the Doctor locked out. Except that the Doctor has outwitted her and she's actually just dreaming about doing this. Weirdly, Clara's attempt to trick the Doctor convinces him to take action — just not the action she wanted. It's a hell of a gutpunch when the Doctor tells Clara, "Go to hell" — but then it turns out he's being literal. He wants to try and use the TARDIS to find where the dead go. And in a lovely turn, the usually acerbic Twelfth Doctor tells Clara that he cares too much about her to let a small thing like her total betrayal change anything. So they try a repeat of that odd "flying by the seat of your subconscious" thing the TARDIS did in "Listen," which led them to Danny's childhood as well as the Doctor's. And this time, the Doctor hopes it'll lead them to the next time or place where Clara and Danny intersect — which turns out to be the headquarters of the place where all those dead people have been turning up throughout this season — the Afterlife controlled by the enigmatic Missy. And it's here that two things happen: 1) Clara finally seems to pay a huge price for imitating the Doctor, in another heart-rending moment. 2) The story seems to lurch off the rails somewhat, as we get more into the actual plot machinations. But first, Clara's price. Even though the Doctor has taken a huge leap of faith, piloting the TARDIS to what he hopes will be the afterlife, he becomes skeptical and even hostile as soon as they arrive in a kind of glorified mausoleum full of skeletons in water tanks. So the Doctor keeps reminding Clara that she needs to shut down her emotions and be skeptical and inquiring, rather than believe what she sees or hears — in other words, she needs to be like the Doctor, something she was getting quite good at back in "Flatline." This leads to a scene where Clara keeps pressing Danny and doubting him, while he's just stunned and thunderstruck to be speaking to her from beyond the grave. He's unable to get it together to answer her questions or come up with some proof of his identity, and he just keeps saying that he loves her. Which Clara says is meaningless, until she knows whom she's talking to. But then Clara promises that if she believes this is Danny, she will go to any lengths to come find him, so they can be together again. And Danny believes that there's only one way to get where he is — by dying. (Clara doesn't explain about how the TARDIS can go pretty much anywhere.) So when Clara says that if Danny says "I love you" one more time without first proving his identity, she's turning off the communication device, Danny says "I love you" — to get her to switch off so she won't throw her life away finding him. Thus proving that he really does love her. It's a beautiful kick to the head, that shows how far the two of them have come. But also, it indirectly shows how Clara's taken the Doctor's way of doing things a bit too much to heart — after having been a harsh critic of his methods earlier in the season, she's embraced them now, to the point where she tries deception on the Doctor, and then tries harsh skepticism on Danny. And the end result of all this is that she may have lost Danny forever. Meanwhile, we get to see the whole "coming to Paradise" thing from Danny's viewpoint as he meets Seb. In previous episodes, the scenes of newly dead people arriving in the Nethersphere were pretty short and snappy, but this time around we get way more of it. And this allows the episode to bring back one of this year's major themes, that of Danny's soldier past and his buried PTSD. When Danny arrives in the Nethersphere, he gets more or less the same orientation that we've seen other dead people get in previous episodes. Except we see a lot more of it, including weird questions about Danny's funeral arrangements (more on those in a moment) and Seb's snarktastic explanation of how the afterlife is just... more life. Instead of a fancy garden, it now looks like a big city, a place where there are iPads (because Steve Jobs is there) and crappy wifi. And Danny's first encounter with someone from his life is not Clara — it's a kid that he killed while trying to clear a house in a village, when he was a soldier. A civilian casualty, who's still just as traumatized by being killed by Danny as Danny is by killing him. And meanwhile, Danny is having super-vivid flashbacks to his soldier past, which are almost as real as his actual surroundings. After Danny's horrible conversation with Clara, which ends with him practically pretending to be a bot so she won't try and join him in the land of the dead, Seb comes back and makes Danny an offer — he can turn off those horrible emotions that are tormenting him, and "Delete" Danny Pink. Danny doesn't know what this means, because he doesn't know about the Cybermen (more on them in a moment, too) — but "Delete," of course, is the Cybermen's catchphrase for removing the human emotions and resistance that stand in the way of their perfect cybernetic world. So Danny is being offered the chance to become a Cyberman, of some sort. Or, really, to become a soldier all over again, but this time with less agency or awareness. Which is odd — nobody's had to "opt in" to becoming a Cyberman before. But this whole scenario is kind of odd. The cremation thing is... weird. A lot of the second half of this episode is super confusing, although it's possible that it'll make a lot more sense after next week's finale. So as Dr. Chang explains to the Doctor and Clara, once people realized the dead actually continue being conscious in some fashion after death, and are connected to their bodies, they set up this company called 3W, referring to those "three words." (Why not just call it "Don't Cremate Me Inc."?) The company is at least real enough that it has a fancy headquarters, with the big sign about guaranteeing that people will rest in peace and stuff. And so I guess the Nethersphere is something that they built as a repository for the dead people's consciousnesses as they leave their bodies — and it's actually just a smallish globe that Missy points out to the Doctor. She says people inside it actually think they're in Paradise, but it's just this weird enclosure that's possibly virtual, or possibly just miniaturized. It's some kind of artificial containment zone for dead people's minds. Like a cyber-heaven — which the Doctor says is Time Lord technology. So the Nethersphere is created using advanced technology, to capture dying minds and edit them, to remove all those messy emotions, while the body is upgraded into a Cyberman. "Cybermen from Cyberspace," Missy says, "Why didn't anybody ever think of that before?" But how does this connect to the fact that Missy apparently manipulated the Doctor and Clara into meeting in the first place and has been watching Clara's progress with interest? And then at the end of the episode, Missy reveals what everybody has suspected from the beginning... that she's actually the Doctor's old arch-enemy, the Master. "Couldn't very well keep calling myself the Master, now could I?" she says. And where do the Cybermen come in, exactly? So yeah, the Cybermen are in this episode, although they don't get to do much. Basically, there are some skeletons inside water tanks, sitting down on chairs, and Dr. Chang mentions that they're wearing exoskeletons that keep them sitting. And it turns out they're sitting in a miraculous kind of "dark water" that makes anything non-organic invisible. A few things about this — why would the only organic part of Cybermen be their human skeletons? I would have thought the skeleton would be one of the first things you'd replace if you were getting rid of organic features, given how breakable skeletons are. Why are the Cybermen just sitting there inside water tanks, even if they're cool water tanks that disguise them as skeletons? I can understand keeping the Cybermen hidden until you need them — but skeletons aren't what you'd call a benign or reassuring disguise. Whatever, it's a cool image, and it's pretty effective as the water lowers and reveals the familiar headpiece. And ever since the Cybermen burst out of their melting ice chambers in "Tomb of the Cybermen," Doctor Who has tried to come up with another cool "Cybermen emerging from an enclosure moment," including a "ripping their way out of packing materials" scene in "Earthshock." This is just the latest "Cybermen busting loose" scene, and it's sort of appropriate for the day after Halloween, I guess. So what's Missy's connection to the Cybermen? She seems to be bossing them around. And maybe she's somehow harvesting dead people to turn into Cyber-soldiers, including maybe Danny. And meanwhile, she tells the Doctor that all the graves of planet Earth are going to give birth — because a key strategic weakness of the human race is that our dead outnumber our living. So I guess a huge zombie Cybermen invasion, bursting out of all the graves, is going to be sweeping across the planet? Okay then. All in all, this is an oddly uneven episode, in terms of both quality and tone. All of the relationship and character stuff — the things involving the Doctor, Clara and Danny — is just top-notch. In fact, the first half of the episode is mostly perfect. 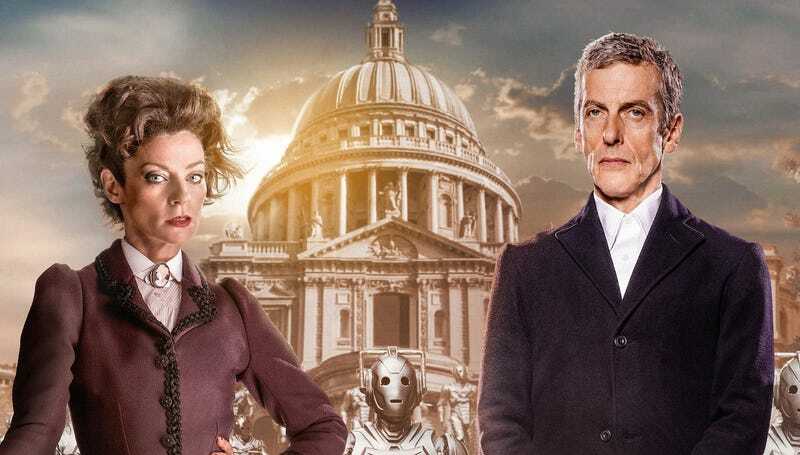 But the plot, all of the stuff involving Missy and the Cybermen and the Nethersphere, feels so random as to leave me scratching my head, rather than dying to find out what happens next. Obviously, we'll find out next week what the endgame of the Missy/Cybermen/Afterlife plot is — but that stuff was so random and handwavy, I'm not even in suspense. On the other hand, the central storyline about Danny and Clara, and whether her love can rescue him from death? That I'm fully on board for.